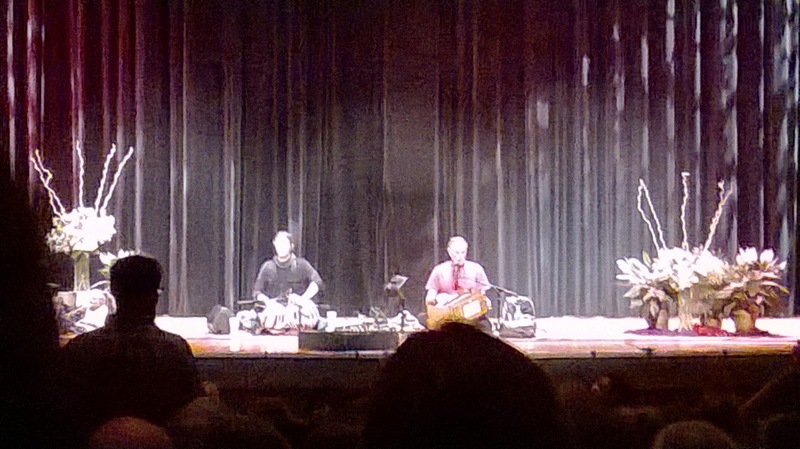 Last night I went to a Krishna Das (KD) concert. I have written about these concerts before, because I always learn or experience something new. There was the time I met Richard Gere and an angel named Michael came to my aid. Then there was the time the buttoned-up concert-goers in Washington, DC just sat there, stone-faced in the audience. Anyway, if you don't know, Krishna Das is a chant master. He was part of that whole thing in the 60s and early 70s where people went over to India and found a guru. Like the Beatles, he has a great, rock and roll voice. Unlike the Beatles (but kinda like Cat Stevens) he stayed to give his life and his voice over in service and devotion to his gods. Whatever he believes is somewhere in the Buddhist or Hindu realm. His concerts are a mix of devotional chant in a style called kirtan and some spiritual teachings. With kirtan, he sings a line and you sing it back to him, so it's a sing-a-long. And the idea is that the sounds you make during this "singing prayer" or chant vibrate in your body, offering spiritual healing and bringing you closer to god. I imagine there are many of other religions that would mock all the "hare Krishnas" and "hare Ramas" and whatnot, but it's the exact same thing as church singing and singing of "spirituals" that happen every Sunday in the US. Just in a different language and to a different god. Which leads to something he does in every concert. All of the songs, except one, are done in Sanskrit. He makes a good point when he says that (because it's your native language) English is the language you berate yourself in. It's also the language others berate you in. But if you do these chants, the words defy definition, but are nonetheless words of love and devotion. They're words that take you out of yourself and focus on the god (Rama, Shiva, Hanuman, whatever) that you're singing about. And when you're singing, it's harder for your mind to wander to other things, like self abuse. So the songs bring you into another place, as long as you're chanting and listening to the call and response. And they bring you closer to your god and further away from self degradation. Anyway, as I said, only one song is in English and he sings it every concert. Surprisingly, it's Jesus on the Mainline. Last night, the crowd went wild when we began singing it. But KD says that every time he does it, he gets angry emails. And that's why he does it. He's a rebel. And he was born Jewish. And he says adulthood is the time to do all the things you were told you couldn't do when you were young. Clearly he couldn't sing Jesus songs as a boy. And there may have been a time that, like me, he had a negative view of Christianity and so he learned the song to open his heart wider. I know that that's usually the way for me...the things I resist the most are nothing more than invitations to open the heart wider. Which can be hard. What he didn't say, however, is that those devotees who complain about him singing about a god who isn't one of the countless Hindu gods (and there are a lot) shines a mirror of hypocrisy in their face. Buddhism and (possibly to a lesser degree) Hinduism, are religions of yielding, inclusion and acceptance. The "rules" are more open than in Christian religions. So when someone from that religion complains about a song like that, they're coming right up against a place where they're stuck. All their elitist complaining is counter to their beliefs. And their anger is an invitation to open their heart wider, as their gods would want. Religion is only one part of life. As we interact globally more and more, our planet becomes smaller and smaller. And there is less and less room for intolerance. You see it everywhere you look, from racism to LGBT rights. There is a softening of edges happening around the world that is beautiful. And all of us are being called out of our comfort zones to expand and open our minds to more diverse things. The good news is that, no matter who your god is, tolerance and love are part of the teachings. So it's god's plan to open your heart wider. The couple sitting next to me was a totally normal couple from Pennsylvania who had never heard of KD or kirtan...they probably don't do yoga or, if they do, they don't think about the yoga songs (which are almost always devotional regarding a polytheistic religion.) They just thought they'd try something new in their 50-something, empty-nester lives. It was a beautiful thing, because whatever bounds were limiting them from exploring eastern religions and practices prior to last night, were coming down. Their hearts were widening. And they loved the concert, especially Jesus on the Mainline. And I think they really "got" it...it's all the same, just different names. People love to say they're open and tolerant, but we can only be as open and tolerant as our need to judge allows us...as our need to be right or have the only acceptable view allows...as our need to hold ourselves to "rules" allows. And there are many kinds of tolerance. Americans will soon have many "invitations to open their hearts wider" as presidential candidates start to square off. To me, it seems sad when someone decides they know all there is to know, whether it's about god or politics or personal freedoms or whatever. Because they close themselves off to possibilities. They close themselves off to learning. They close themselves off to growing. The couple next to me (I'm imagining...haha) reached a certain place in life and decided to continue learning and exploring and opening up. I think we all reach a crossroads like that at one time or another. In many ways, my life's journey has been about opening ever wider to things that cause a strong negative reaction in me. It's the basis of spirituality, I think, because it brings you closer to god. And it doesn't matter whether you sing about Vishnu or Jesus...the name means nothing. What has meaning is what's in your heart.